There are plenty of books out on Heaven currently. This is one among them. Scot Mcknight is a talented writer. His book is interesting to read. I can agree with much of what he said, if I give him the benefit of the doubt in some areas. The difficulty I have with Christian books is that I look for books that will add value to the Christian’s library. In the world of Christian books, I read works of scholarly endeavor, and works for the laymen. In those two groups I apply the same standard, “Does this book rise above the current crop and add value to my library?” Both categories are flooded, and in my opinion encumbered by copious amounts of average to damaging works. Every once in awhile I run into a book that does add value to my library. I heartily recommend those books. In the laymen’s category, I loved, “Crazy Love” by Francis Chan. I also loved, “The Holiness of God” by R. C. Sproul. In the scholastic category, I relished, “Evangelical Influences” by J. I. Packer. Books like those don’t come around often. To answer the question formulating in your mind, “Nope, this isn’t one of them.” Like I said above, “Scot Mcknight is a talented writer.” Unfortunately, this book just sets in the middle of the field. This book was not aimed at scholars. It was aimed at the average Christian. It kept things pretty simple. It is obvious that Scott leans a little to the left theologically. He seems like, “emergent lite.” He obviously thinks Calvinists are wrong. (Read page 174) He quotes John Henry Newman and Richard Foster. One is a Roman Catholic, and the other is an emergent Church mystic. He makes speculations based on only four options expressed by Jerry Walls, about how God ensures that everyone, even the dead get to hear the gospel. He does this without ever really presenting the gospel. The four presupposed options are severely lacking. This is done on pages 160, 161. In Chapter 23 he claims purgatory is a doctrine that has divided the Church. To that I can only shake my head in astonishment. Unless, in his horrible ecumenism he thinks the Roman Catholic Church is part of the catholic faith, he is including them as Christian. It also seems that he is teaching that we do things for an eternal reward primarily. He fails to teach that we should be doing things primarily for the glory of God. We know that there are rewards for us in Heaven, but that should not be our primary motivation for doing things that are pleasing to God. He also seems to place an undue amount of importance on the environment. I don’t know if he understands that God is going to destroy the world with fire. He tends to speculate where scripture is silent. So if you are looking for a book on Heaven, that will add value to your library, purchase, “Heaven” by Randy Alcorn instead. 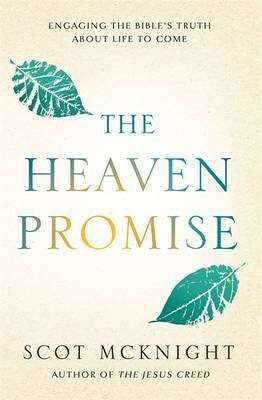 “The Heaven Promise” by Scot McKnight is just mediocre. It has some problems. It gets some stuff right, but ultimately it is just o.k.